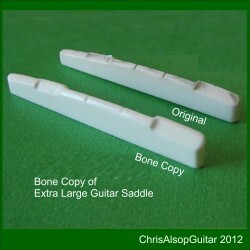 This is a custom made saddle that is over 3.9mm wide or over 80mm long or over 9.5mm high. Maximum width for this advert is 4.5mm - for saddles over 4.5mm to 6.0mm see our other 'oversize saddle' listing. Your saddle replacement is in good hands.We have the right experience of manufacture and we know what a guitar needs to give the best tone and intonation.